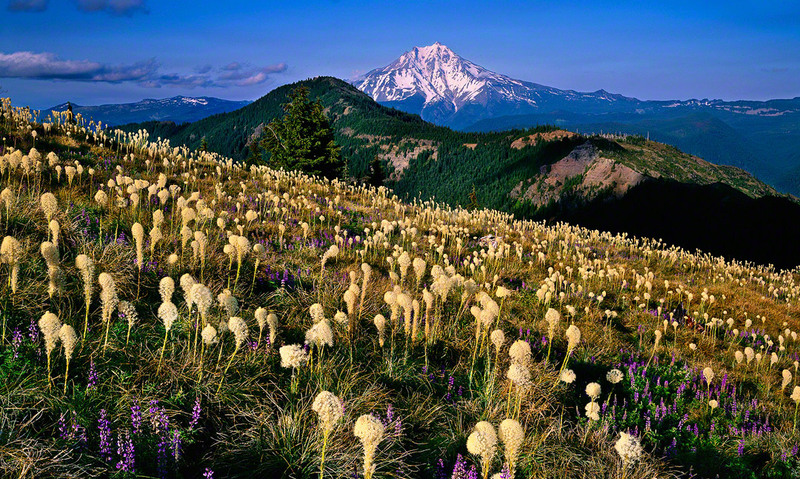 The photogenic Mt Jefferson, seen In the fine art photo above, is the centerpiece of the Mt Jefferson Wilderness Area. At 10,497 feet tall, Mt. Jefferson is the tallest of the Central Oregon volcanoes. In addition to Mt. Jefferson, the wilderness area also includes Three Fingered Jack Mountain. 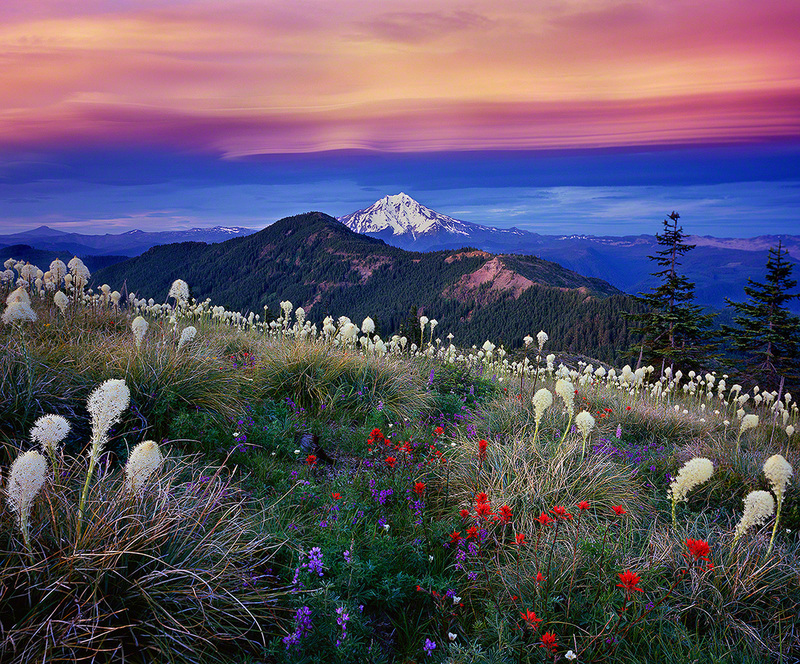 It encompasses over 104,000 acres, 160 miles of trail, 40 miles of which are part of the Pacific Crest Scenic Trail. 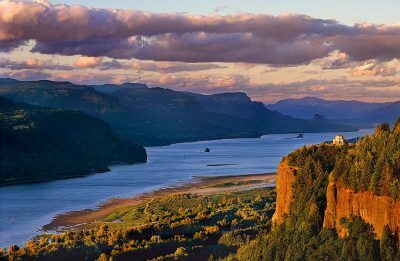 There are many rewarding trail heads for Oregon’s Mt. Jefferson area. Some of the most direct access points are, the Jack Lake Trail head , and the Carl Lake trail head near the Metolius River and the quaint community of Camp Sherman. From the West, the Mt. Jefferson Wilderness Area can be accessed via the Whitewater Trail Head and the Breitenbush Trail Head. “Mt Jefferson Wilderness Area” The capture. I captured this stunning fine art photograph of the Mt. Jefferson Wilderness Area from near Jefferson Park, which is a high alpine basin on the north side of the eponymous mountain. Mt. Jefferson, the only mountain named by Lewis and Clark during their Corps of Discovery Expedition, is beautiful from any perspective but my personal favorite view of the mountain are from Jefferson Park. I’ve made the 6 mile hike to Jefferson Park many times in the past and I intend to return many more. The Jefferson park area contains several alpine lakes, some of which are stocked with trout. My favorites include Bays lake, Scout Lake and Russel Lake. 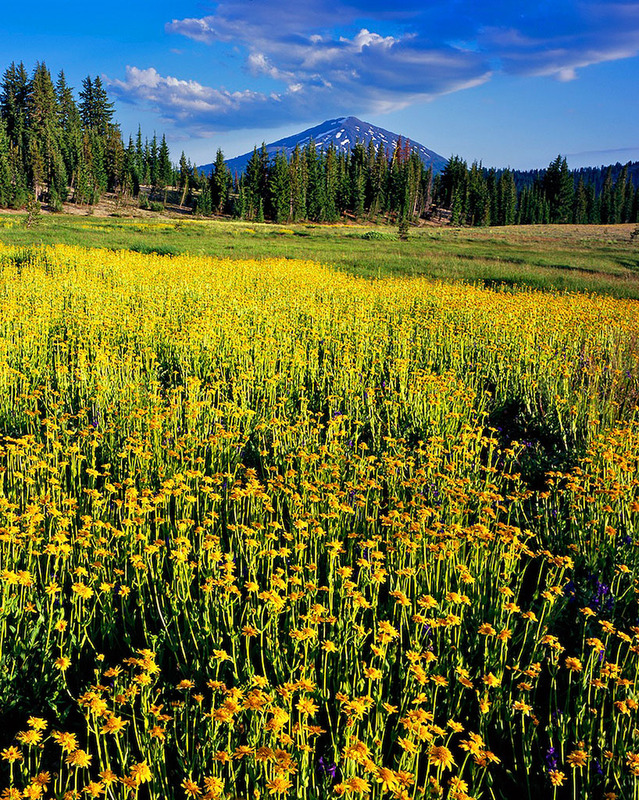 In addition to lakes, streams, and sublime views, Jefferson Park offers some stunning wildflowers in select years. Three days prior to capturing this stunning photo of Mt. Jefferson, I’d been exploring the Jefferson Park Area with my good friend, Troy McMullin. We stumbled across this location and I was immediately smitten. I recognized that the wildflowers would peak a few days later and I instantly made plans to return. When I backpack with my full camera pack my beloved Dana Design Terraplane tops out at about 70 pounds. That’s why I decided to return to the Mt. Jefferson Wilderness Area with large format camera gear and only minimal survival equipment. I returned to this magical location with time to spare. The wildflowers were peaking and I excitedly began to set-up the scene you see in this, one of my most popular Oregon fine art landscape photographs. 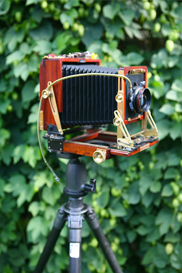 Working with my 4×5 camera is an almost spiritual combination of Yoga, and photography. I knew the scene was stunning but I didn’t know it would soon get better! The Oregon Cascades are periodically have interesting lenticular cloud formations overhead but they are unpredictable. As I composed this image, a wisp of clouds over the summit of Mt. Jefferson morphed into the wonderful Nike Swoosh you see above. I was excited to the point of nervousness. It was thinking, “Oh My, don’t screw this up, don’t screw this up, don’t screw this up”! 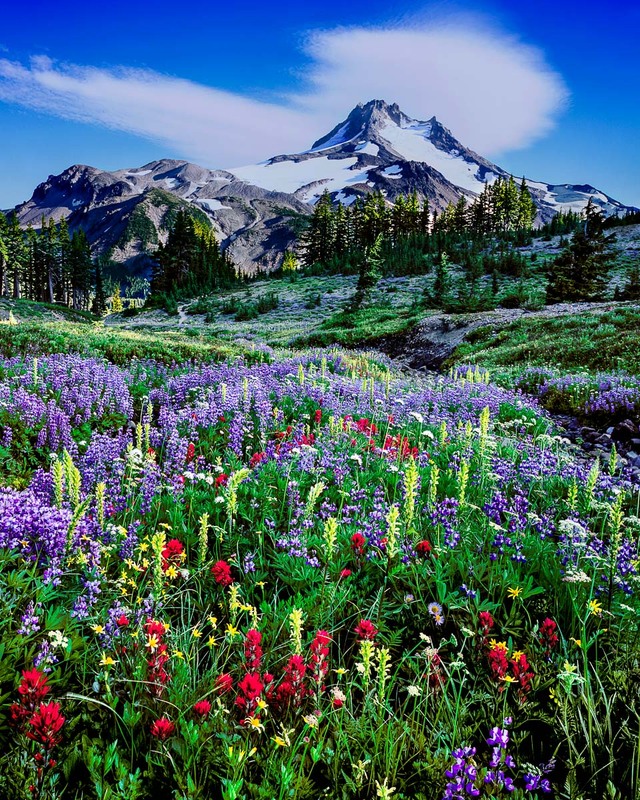 The best grouping of wildflowers I’ve ever witnessed in the state of Oregon, Mt. Jefferson’s grandeur and a spectacular Lenticular cloud cap all in one image. Magic! The image I captured that day makes one of the most beautiful fine art landscape photographs I’ve ever seen. I sold this Photograph as small as 11×14 inches and as large as 40×50 inches. It is stunning at any size! 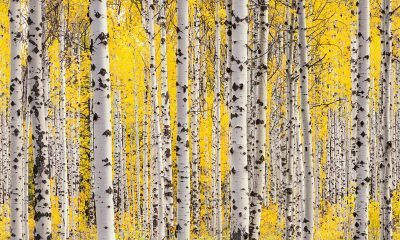 In addition to fine art photographs, I also sell greeting cards of this image, Mt. Jefferson Greeting Card.